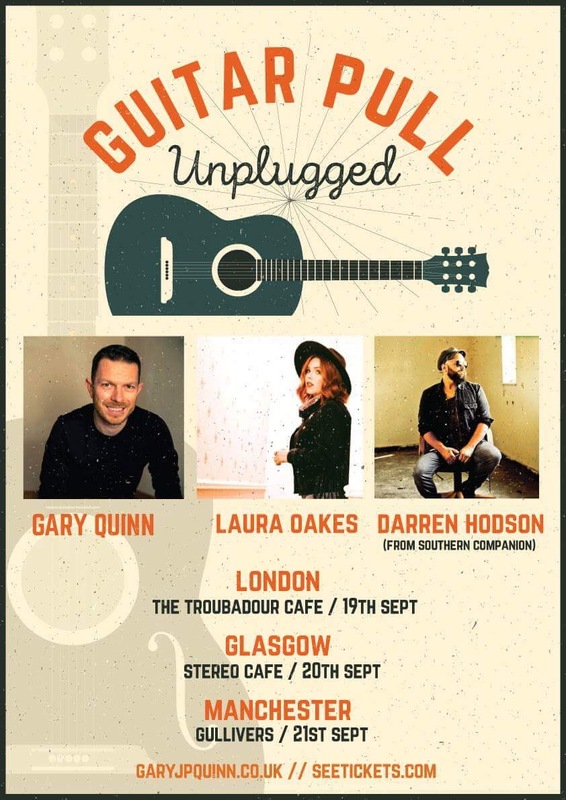 Three of British country music’s most accomplished and awarded performers, Gary Quinn, Laura Oakes and Darren Hodson (The Southern Companion), will be joining forces this September as ‘Guitar Pull Unplugged’ hits the road, visiting London, Glasgow and Manchester. Deriving the name from the American southern state tradition where a group of musicians sit and take turns playing songs on their guitars, ‘Guitar Pull’ will give UK country fans the opportunity to take in the tales behind the songs in a wonderfully intimate environment. Reigning BCMA Male Vocalist Of The Year, Gary Quinn, is set to release his brand new acoustic record ‘The Lounge Recordings‘ very soon and will no doubt be showcasing his fresh material. Another trip to Nashville towards the end of 2017 allowed Gary to spend time with the likes of legendary songwriters Steve Wariner and Phil Vassar, adding another dimension to Gary’s critically-acclaimed writing expertise, and his upcoming EP will follow his ‘I Remember’ EP which included a string of fan favourites like ‘Shame’ and ‘Body Language’. His performances at the likes of Buckle & Boots and Millport have proved hugely popular with festival-goers and there’s absolutely no questioning his experience on the UK circuit. 2-time Female Vocalist Of The Year, Laura Oakes, released her stellar ‘Nashville Stole Your Girl’ EP towards the end of 2017, featuring the fan favourite festival anthem ‘Better In Blue Jeans’. The release topped off a year of stunning performances all over the UK, including slots at the likes of Cornbury Festival and Cottingham Folk Fest, cementing her place as one of UK country’s fastest rising talents. Ben Earle from The Shires said Laura has “… one of the most powerful, exciting voices in UK Country”, and over the years she has garnered loyal support from BBC Radio London, Bob Harris on BBC Radio 2 and Chris Country Radio. The Southern Companion have truly made their mark in the last couple of years and captured the hearts of UK country fans far and wide. ‘1000 Days Of Rain’, their most recent album, stunned critics and fans alike with the incredible musicianship of five immensely experienced and accomplished musicians, and featured ‘The Leaving Kind’ which was recently championed by Bob Harris on Radio 2. The group have just finished working on their third album, ‘Shine A Little Light’, which will no doubt be showcased impeccably by front man Darren, who can pull off an acoustic performance like few others can. ‘Guitar Pull’ promises to be a totally unmissable evening of live music – be sure to get your tickets while you can!